Traditional Chinese Medicine (TCM) is a holistic medical system encompassing acupuncture, Chinese herbal medicinals, tuina massage, moxabustion, cupping and dietary/lifestyle practices. The goal of TCM is to restore balance within your body. Western medicine studies symptoms to identify a disease, whereas TCM sees the body as one whole entity and assesses symptoms as patterns of imbalance. TCM considers signs and symptoms from various perspectives, and assesses each individual’s unique pattern or patterns to determine an appropriate treatment plan for healing conditions and maintaining balance. This allows for a very specialized type of treatment based on each individual, rather than viewing disease as a uniform condition that implements the same treatment for everyone. 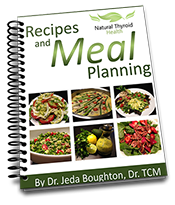 This technique provides the complexity and depth TCM needs to be a truly holistic medicine. 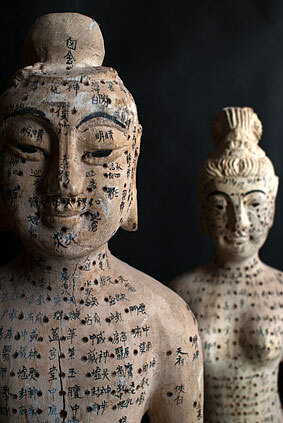 The use of Chinese herbs and acupuncture provides the means to establish harmony and balance in the body. With a goal that focuses on resolving imbalances, Traditional Chinese Medicine (TCM) begins with a thorough evaluation of all your body’s systems. Acupuncture is researched extensively in the West and is endorsed by the World Health Organization as an effective form of treatment for addressing health problems, such as infertility, hormone and thyroid imbalances, menopause symptoms, digestive dysfunction, fatigue, heart disease, insomnia, skin diseases, gynecological diseases, paralysis and strokes among others. Acupuncture is also effectively utilized for treating addictions, anxiety, depression, colds, allergies, stress, pregnancy associated complications, headaches, chronic pain and musculoskeletal disorders as well as health problems of women like prolonged labor, PMS or premenstrual syndrome, leucorrhea, uterine bleeding, amenorrhea, dysmenorrheal, menopause endometriosis and many more. The application of acupuncture involves the use of single-use and sterilized hair-thin needles inserted into various regions in the body. The needles are inserted about ¼ - 1 inch underneath the skin. The needles elicit certain types of sensations including heaviness, distention, tingling, heat, cold or an electric-like feeling traversing the treated meridian. Patients are advised to wear comfortable loose clothing to enable easy access to commonly treated areas of the body while remaining as fully-clothed as the specific treatment permits. 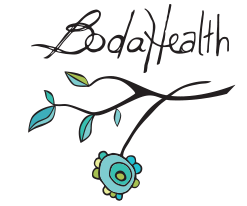 BodaHealth practitioners understand the strengths and limitations of both conventional medical and TCM therapies, and utilize the TCM principles to effectively address problems that have failed to respond to other treatments. We do integrate treatment plans where possible with your other healthcare providers to fully complement your wellness. We want to thank you for visiting our website, and in return we would like to offer you a FREE Acupuncture Health Assessment ($95 value.) This coupon is good for one initial exam and limited to one coupon per person. Click on the coupon to download it before this offer expires. Click on coupon to get it now. Call us today at (604) 733-2632 to book your Free Health Assessment with one of our licensed practitioners and experience a form of medicine that is natural, safe, effective and drug-free. 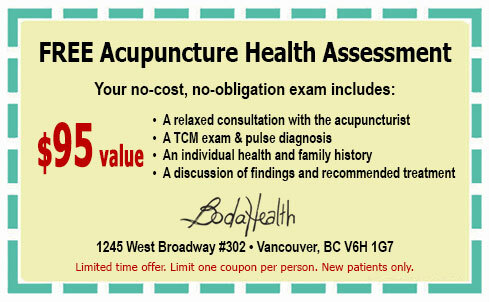 Visit our FAQ page for answers to other questions regarding Chinese Medicine and acupuncture in Vancouver.